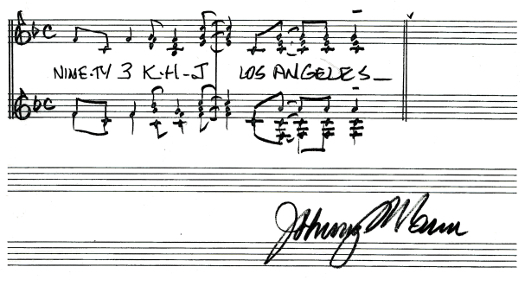 During the course of his long career musical conductor/arranger/singer Johnny Mann won two Grammys, recorded more than 30 albums, and worked with just about every big name in Hollywood. He died June 18 at age 85. But my association with Johnny was due more to his side career, penning and producing jingles for top 40 guru Bill Drake in the 1960s and 70s. While most AM rockers had been using 30-second singing IDs that extolled in great detail the merits of the town, the music, the news and weather, Drake had Johnny Mann cut the new lyrics down to the basics: "93 KHJ" or "The Big 8 CKLW," for example. While these jingles may not have won awards for great lyrics, they were short, punchy and memorably identified the station. Other ID jingle producers of the day including Dallas stalwarts PAMS, CRC, and Gwinsound, were caught flat-footed, and suddenly had to produce shorter jingles for a market that now demanded them. I first contacted Johnny so that I could interview him for a paperback I was writing called "The Jingle Book," which is (shameless plug) available through Amazon. Johnny was warm, forthcoming and had a lot of funny stories to share. In the mid-1960s, radio formats were getting tighter, meaning less DJ chatter, fewer public service announcements, and a shorter music playlist. Johnny Mann became a big part of this trend so I had to get the story behind his success. "When the general manager of KHJ(AM), Los Angeles contacted me to produce some ID jingles for him, the musician’s union was on strike," Mann told me. "So I suggested acapella jingles, which meant no instruments, just voices. The manager was worried that voice-only jingles would sound thin on the air, but I told him, no, I thought they would stand out!" And stand out they did, eventually being customized by Johnny and his Los Angeles-based vocal group in a similar fashion for stations in New York City, Detroit, San Francisco and dozens of other markets. But I knew Johnny outside of the music realm as well, and he was a good friend. He and his wife Betty included me on their Christmas card list, and we enjoyed a very pleasant relationship. Johnny was kind, enthusiastic and had a great memory of just about every note he ever wrote or sang. For a period in the early 2000s he granted me the right to sell copies of his radio jingles on CD to collectors all over the world, and yes, there is such a thing as a jingle collector. These guys are twice as geeky as record collectors, and I’m proud to be one of them myself. So Johnny shipped me his tapes, and I proceeded to clean them up sonically and master them to CD. They were big sellers and I ended up writing Mr. Mann quite a few royalty checks. I’ll leave you with one Johnny Mann story. When he first arrived in Hollywood in the 1950s, Mann, already a capable arranger and vocalist, wanted to build a reputation as a studio singer, one of those guys who backs up big-time recording artists. He got a call from his manager directing Johnny to show up to a session for an unnamed artist at a particular studio at a certain time. Johnny walked through the door and found that for his first backup singing gig the client was Frank Sinatra. Talk about starting at the top.